These easy-to-cut blocks are ideal for beginners and advanced printmakers alike. Because they're made of clear PVC, Blüm Clear Printmaking Blocks can be placed directly over drawings or photos for reference. The PVC is softer than other materials and allows for crisp, clean, accurate cuts. A rubber-like material on the bottom of the blocks eliminates slippage. 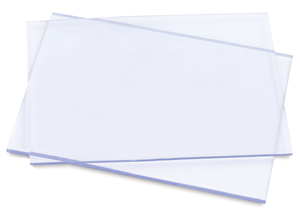 Blüm Clear Printmaking Blocks are 1/8" (3.2 mm) thick. ™ Blüm is a trademark.